My tag line may be a bad joke, but it’s by far the worst thing about this post. 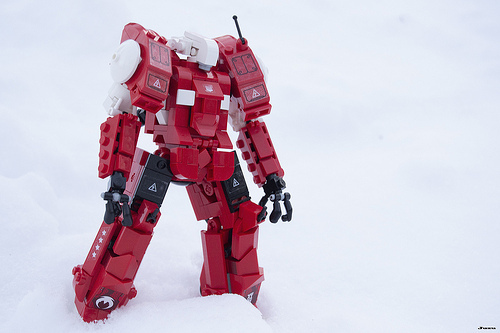 Juzu has posted a pretty cool looking mecha over on Flickr, and taken advantage of his local weather for a change in scenery. The build itself makes fantastic use of stickers to add detail to a form that’s curvy and bulky in all the right ways. The snowy background, and off center composition of the photo, draw attention to the build in a manner that adds a feeling of authenticity to the photo.